Then in April 2017, Vadim Tkachenko announced the availability of experimental builds of Percona Server for MySQL with the MyRocks storage engine. 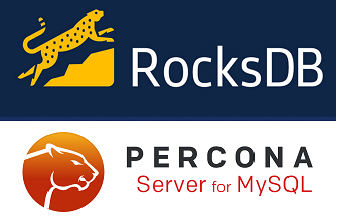 Now in September 2017, we are pleased to announce the first full experimental release of MyRocks with packages for Percona Server for MySQL 5.7.19-17. Percona MyRocks is distributed as a separate package that can be enabled as a plugin for Percona Server for MySQL 5.7.19-17. WARNING: Percona MyRocks is currently considered experimental and is not yet recommended for production use. Due to the differences between Facebook MySQL 5.6.35 and Percona Server for MySQL 5.7, there are some behavioral differences and additional limitations. Some of these are documented here. We encourage you to install and experiment with MyRocks for Percona Server for MySQL and join the discussion here. Any issues that you might find can be searched for and reported here. We thank the RocksDB and MyRocks development teams at Facebook for providing the foundation and assistance in developing MyRocks for Percona Server for MySQL. Without their efforts, this would not have been possible. George joined the Percona development team in April 2012. George has over 20 years of experience in software support, development, architecture and project management. Prior to joining Percona, George was focused on Windows based enterprise application server development and network protocol classification and optimization with heavy doses of database schema design, architecture and tuning.